Source: Received from eBooks for Review. When an attractive girl tells Jacob he's the Forsaken Prince and that an entirely different planet needs his help, he calls her crazy and sends her on her way. But then he discovers dead demons in his house, his mother beaten, and his father and sister kidnapped, and he's forced to begin a dangerous journey. Now Jacob must team up with Aloren to find a magical key and stage a rescue with a tight deadline, all while making decisions that affect not only himself but hundreds of thousands of his subjects in this new world. Can he figure out his new magical powers fast enough and will he and Aloren reach Jacob's father and sister before time runs out? Forsaken Prince, Kilenya Chronicles Book One is an edge-of-your-seat story of fantasy, adventure, and exciting twists and turns. Secure your copy now to begin the magical journey! 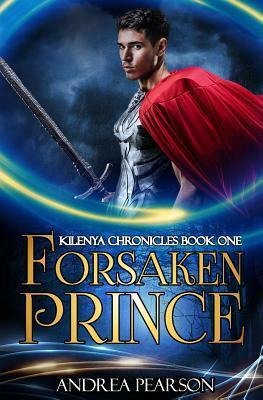 NOTE: Forsaken Prince is The Key of Kilenya rewritten and reimagined. Jacob is two years older and the story reflects that change of age. It is an edge-of-your-seat story that'll keep you reading late into the night. Enjoy! My thoughts: This is a great fantasy book for young fantasy lovers. It moves at a quick pace and the writing is easy to read and understand. I think that it would be a great fit for an in-between reader, someone who needs a little more to a story and not ready for the in-depth plot of a more advanced book. I enjoyed the story and the characters. Andrea Pearson did a great job at laying down the foundation for her series. A young man finds that he is a Prince from another world and is called to rescue his father and sister when they are kidnapped by one of the kingdom's enemies. For me, the story lacked depth. It went a little too fast for my taste and brushed over details. Like I stated above, this is a perfect book for someone looking for a light fantasy or is a younger reader. The book does contain some violence. 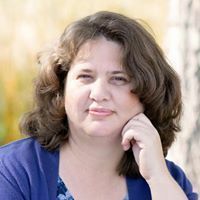 About the Author: (Taken from Goodreads) Andrea, a Brigham Young University graduate, is an avid reader and outdoor enthusiast (hiking, fishing, boating, biking, spending time in the Rocky Mountains, and taking walks). She spent a year and a half serving the Spanish speaking community in Toronto, Canada, and fluently speaks 2 ½ languages. She plays several instruments, not including the banjo, and loves putting together musical arrangements. Her favorite sports are basketball and football, though several knee surgeries and incurably awful coordination prevent her from playing them. Did you miss a Romance is in the Air Promotion Post? Check out the link for ALL of the giveaways! Book Description: Having been the class clown through most of her teenage years, eighteen-year-old Ashley Sweeney is ready to leave her family, friends, and reputation behind and start a new life in sunny California. But Ashley's determination to show her dad and stepmom that she can handle herself in the big wide world falls apart when she becomes the victim of a mean-spirited prank. To make matters worse, the one guy she never wanted to see again has come to her rescue. Collin Nichols wanted to serve an honorable LDS mission from the time he was old enough to know what one was. But when the former high school football star's missionary service comes to a crashing halt, he's suddenly the most unpopular guy in Forest Meadow, the small LDS town he grew up in. Now, to avoid his parents' disapproval and awkward stares from people who used to be his friends, he gladly accepts Ashley's dad's plea to help him bring her home safely. If only he can get Ashley to see things his way . . . and if only he can forget the electric kiss they shared back in high school. But getting home is only half the battle. Ashley soon is caught up in the craziness of college life and Collin is forced to stand on the sidelines and watch as she receives attention from a returned missionary who seems like the perfect match for her. But when an unexpected visitor from her past shows up on her doorstep, will she need to be rescued once again? And when the clouds finally lift, will they have formed a new love in their mist? 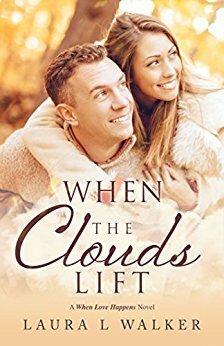 When the Clouds Lift is the first installment in Laura L. Walker's new LDS romance series, When Love Happens. Enjoy the beautiful setting in central Idaho as three friends find the love of their lives--for eternity. My thoughts: This is a very sweet little romance. The characters are flawed and learn about themselves, the meaning of love, and healthy relationships. The book is one of forgiveness, forgiveness of self and of others. Ashley is a young woman who has a hard time believing in herself, and because of this she makes some bad decisions. She is gullible, because of her need to be accepted and loved. She comes from a home where her mother passed away and now has a step-mother. She feels a little less loved and secure in her family relationship. Collin was her high school crush. Now, he is her rescuer. I enjoyed reading about them stumbling through roadblocks to realize their feelings for each other. The bottom line is this is a book with characters who do stupid stuff and then learn to forgive themselves and others. It has religious themes specific to the members of The Church of Jesus Christ of Latter-Day Saints. It is clean with a little kissing. It is available for Kindle Unlimited! About the author: (Taken from goodreads) Laura L. Walker grew up in a large family in the beautiful Gila Valley of southern Arizona. From the time Laura was young, she spent hours drawing characters on paper and fantasizing about their adventures. Life became more serious, however, when Laura met her own hero and they eventually became the parents of six children. In between spurts of grocery shopping, sewing costumes or quilts, transporting kids to practices, and making dinner, Laura still enjoys putting her imagination to good use. She is the author of two contemporary romances. Visit her at http://www.lauralwalker.com for updates and more. With this Click I Thee Wed by Bonnie R Paulson is having a bookblast with a giveaway! With this Click, I Thee Wed by Bonnie R. Paulson "Uh, oh, what did I do?" A lonely divorcee… A rancher who can lose everything… One website that matches them for marriage… They have to learn about the importance of decisions and family or lose their one shot at love. Stuck in a town where everyone knows her and her ex-husband, Rachel is distinctly aware of who chose his side – everyone – and who chose her side – no one. Even her hairstylist won’t schedule her. But when she finds herself alone with a bottle of chianti and the internet, Rachel stumbles upon Clickandwed.com. The survey is easy and clicking “I Do” seems to be the magic button she’s been searching for. Before she can snap out of her decision, she finds herself packed and flying across the country to meet her new husband. Would her new life be better or worse than the hell she left behind? Author Bonnie R. Paulson Real people, real loss, real love. USA Today Bestselling author, Bonnie focuses on the emotional thrill of the romance, the discovery of self and the dynamic forces at play to both pull and push love growth. With 6 children and her own eternal romance at home, Bonnie lives her own dream every day. She's spoiled with blessings and wants to share the joy of ever-after possibilities with others. Whether it's a happy-ever-after or a happy-for-now, the emotions will leave you story drunk for days, if not years. Feel good romances with sweet twists. Or is it Sweet romances with bold twists? You decide. You'll be able to say where you were when you closed the book. Surviving all things real and coming out better on the other side. Some of her favorite authors are Robyn Carr, Pamela Kelley, and Christine Kingsley! 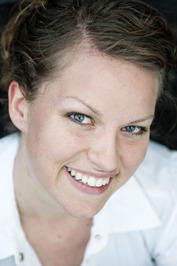 Kimberley Montpetit is part of the Romance is in the Air Promotion! A Great Love Story for everyone! This was a very moving romance about loss and moving forward with life and forgiveness. It shows how much we can inhibit our growth after a devastating event. Recommend this collection for teens to adults, along with a few Kleenex. Have liked the Snow Valley Series. Wish it was a real place to go and visit for Christmas! It was James, standing tall, fresh and perfect in her foyer, although overdressed in a gray woolen overcoat like the Pastor Dude he was. At least that’s what Jessica’s eighteen-year-old brother, Sam, called him. Jessica’s mouth quirked up and they grinned at each other before he gave her a long, slow kiss. Author Kimberly Montpetit When she was in Paris, Kimberley Montpetit spent most of her souvenir money at the La Patisserie shops with their beautiful and delicious pastries. She grew up in the fabulous city of San Francisco, loves all things chocolate, and now lives in a small town along the Rio Grande with her engineer husband and three sons. She once stayed in the haunted tower room at Borthwick Castle in Scotland and didn't sleep a wink, sailed the Seine in Paris, rode a camel in the ancient world wonder of Petra, shopped the Grand Bazaar in Istanbul, and spent the night in an old Communist hotel in Bulgaria. Kimberley also writes Award-winning Middle-Grade novels with Scholastic and epic Young Adult novels with Harpercollins under the name, Kimberley Griffiths Little. Against the Magic by Donna K Weaver Reese Hamilton has big plans to help make the world a better place and a new job lined up to help her do it. Before starting work, she heads to England for a Regency immersive experience. She doesn’t expect her best friend to invite her heart-destroying brother to join them. Two years hasn’t been long enough for Reese to forget him. Then fae magic rips them back to 1850. It’s a time when women have few rights. It’s also a time when a determined woman could make a difference, with the right man at her side. Reese finds she will have to choose between two men and two times. Jem Taylor messed up big when he walked away from Reese to pursue his dream job. He hasn’t been able to forget her and jumps at his sister’s invitation. Suddenly hurtled into Victorian England, he has the chance to woo Reese again. But to do it, he’ll have to fight the magic that brought her to 1850 and an Earl with the means to keep her there. “To your tenant village, my lord.” When his gaze darted to hers, she arched a brow, daring him to stop her. . Author Donna K. Weaver Award-winning author, wife, mother, grandmother, Harry Potter geek, Army veteran, karate black belt, and online gamer girl. Cover Reveal for Sarah Eden's "Long Journey Home"